Maxxstream, Mp3 Player Software from Waves. Waves Audio introduces MaxxStream, which according to them is an all-in-one software solution which uses Waves processors to condition and optimize the audio quality in streaming media formats for better, clearer sound. Consisting of the MaxxStream application with its plug-in chainer, as well as SNMP-monitoring utilities, we're told that MaxxStream lets streaming media providers harness the power of the Waves audio tools. The MaxxStream chainer is designed to hold up to eight Waves plug-ins and support up to 16 encoder instances simultaneously. A single input channel may also be directed into several MaxxStream stations and processed specifically for each designated target. Additionally, it performs multiple high-quality sample-rate conversions to multiple bit rates in real time, and it combines audio capture and conditioning into a single, real-time process. 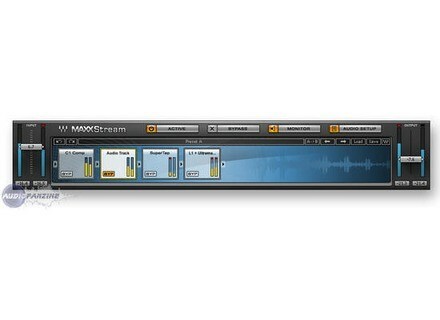 MaxxStream also doubles as a standalone software processor for live audio. Users can connect their sound source to their audio card or external I/O, and load MaxxStream with Waves plug-ins for a powerful stereo multi-effects unit. MaxxStream comes bundled with more than 50 factory presets, taking the guesswork out of creating streaming configurations. It also uses 32-bit floating point processing throughout, as well as a Watchdog utility and basic SNMP monitoring and control. It is compatible with Microsoft® Windows XP, Windows Vista and Windows Server 2003. Multi Export Audio Pro saves you time Attention Cubase & Nuendo users! If you're working on a PC, listen up! MEAP could just be what you need to save your day! Ueberschall Trance ID 2 Ueberschall announces the availability of Trance ID 2. Sonnox Elite Oxford plugin collection Sonnox has introduced Sonnox ELITE, the collection of their entire product line.